Most who will purchase the new Janome 12000 will own a computer, and whether laptop or desktop, it will be essential that they have the ability to connect their Janome 12000 to the computer. The reason for this is to utilize the new HorizonLink program. HorizonLink offers Janome 12000 owners a number of great functions. What I like most about HorizonLink is the Stitch Composer Tool that enables you to create new stitch patterns, and the ability to combine stitches together while on a computer. 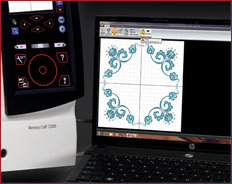 And if that isn’t enough for you, Janome’s HorizonLink will add additional stitches to already formed decorative stitches within the software, and finally to send the entire combined stitch pattern to the Janome 12000. Your stitches are only limited by your creativity! Stitch Composer will also let you, the designer, create your own decorative stitches/alphabets for quilting and embellishing. Your custom design patterns may be combined with the decorative stitches and/or any of the ten (10) alphabets from HorizonLink for unique pattern combinations. 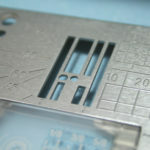 As soon as the stitch pattern is sent from the computer to the machine, the stitch pattern appears on the Janome 12000’s screen. The new 9mm stitch width capability of the 12000, enables you to create awesome results with stitch patterns. New stitch patterns may be modified by using a “shift” to insert characters (patterns) into the pattern with or without inserting space within the stitch pattern, then saved on either, or both, the machine and computer. 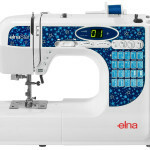 With Stitch Composer, you have the ability to save up to thirty (30) stitch combinations on the Janome 12000. HorizonLink also provides you with the ability to import your own photos into the screen saver feature of your machine, with up to six (6) of your own photos. You also have the ability to determine the length of time each photo is displayed. The timing can be set from 2 to 30 seconds. 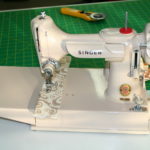 HorizonLink offers a 12000 Help Movie, to aid you with basic operating functions such as: winding the bobbin, threading the machine, threading the needle, embroidery settings, buttonhole sewings with the Stabilizer Plate (standard with the Janome 12000,) replacing the needle, attaching the new dual feed holder, replacing the needle plate, and connecting to the PC. Yes, there will be a standard owner’s manual, but having the help movies is so much more modern! When you receive your Janome 12000 and HorizonLink, it is paramount that before installing the HorizonLink that you update your computer’s operating system. As long as you are connected to the Internet, this is done easily through the control panel. Janome’s software, HorizonLink and MBX-4 have specific (albeit minimal,) computer requirements (2 GB RAM, 64-bit O/S.) Just about any new computer that runs Windows will work. For Mac owners, you will need to use your Mac’s boot camp (dual boot environment), or run virtualization software, like Parallels, in order to use the new software in a Windows environment. We’ve helped set up Windows software on Macs using both of these methods. Boot Camp would be the preferred method, because when running Windows in a virtual environment, it shares RAM and the CPU with the host operating system. 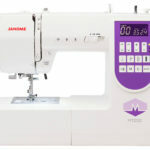 Keep in mind that when you purchase your Janome 12000 and software at Temecula Valley Sewing Center, we will do our best to help you install the software on your computer if you require assistance. Due to the nature of computers, we cannot guarantee that we will be able to do it without Janome’s assistance, and there may be times existing hardware or software problems within your computer make it impossible for us to install the HorizonLink or MBX-4 software. If you need a new computer, Brian has been known to go shopping with customers to assist them with selecting an adequate computer. Can the designs be transferred via USB rather than hardwiring the machine to the computer? Thanks for the further insights into the 12000. After the Janome buildup, it's been a let down to not have much new information. Aileen, who doesn't even know what the difference between 32 bit and 64 bit is, is the one who wrote this blog post. She and I spoke just now, and she said that Janome recommended the 64 bit, but that it will work on a 32 bit computer. In case you are wondering, the main difference between the two is the amount of RAM that the operating system can utilize. A 32 bit operating system only uses up to 4 GB RAM, and a 64 bit is only limited by the amount of money you have to spend on RAM. I have two 64 bit Win7 computers, one with 6GB RAM, and one with 8 GB. It truly makes a difference in the speed that the computer does things, and in the case of programs that require a lot of system resources, like embroidery software, a 64 bit Win7 computer would be the best option. Designs can be "plugged in" to either of 2 slave (b type) USB ports on the side of the machine. It may be a let down to not hear all the details, but you only have another 13 days until the machine is released to the public! I love reading this information you supply. Thank you very much. You do not have to get a new computer as long as your computer has windows 7 on it alread. All you have to do is get windows 7, 64 bit put on your computer in stead of a exciting 32 bit. I hope this helps. Would it be possible to have a pdf of both the o/s for the Horizon link and the Digitizer MBX, as I only have XP on my laptop in my sewing room and would also have to look at purchasing a new laptop to run the programs, and need to make sure that all the boxes are ticked. I'd be glad to provide everyone with the PDFs when Janome makes them available, but they haven't been given to us yet. Keep checking back. I have a 12000, and I cannot get it to recognize my USB stick. I was told to buy a new one but that has not worked either. I was told when I put the USB stick in that it might take up to 15 mins to recognize it and two signs should come up; EMB and Ordinary. Neither of these have happened. and I have not been able to transfer any patterns from my laptop. The window that shows an icon to send is not light up. I am pulling my hair out after trying to get this to work for two weeks, and I am not computer literate. Can anybody help please? How do you get Horizon Link on the Acer W500 tablet? I have it installed on the desk top but can't figure out how to get it on the tablet. I'm ordering a new laptop for Digitizer MBX. All of the new laptops come with WIndows 8. I noticed in an earlier comment that it states it works best with Windows 7 or higher. Is there any confirmation that the software / upgrade will run on a Windows 8 machine? Is there a manual for Horizon Link? My Janome dealer is a wonderful instuctor, but I have a hard time absorbing it. I need a instruction book that I can refer to. The instruction book for the sewing machine is great. Please can you help me! Has anyone seen the computer specifications to run MBX? I currently have Digitizer Pro and am running it on a laptop with Windows XP that is running slowly and that Microsoft will no longer be supporting. If I upgrade my laptop, I am thinking of also upgrading digitizer. Want to be sure I'm making the best informed decision for a computer. Any suggestions would be welcomed! Sherry, please do us all a favor and replace the laptop! When an operating system stops receiving security updates, it becomes a hacker's playground. I don't have the specs for MBX, but any decent laptop will due. I've had a few laptops, and I like Toshiba laptops the best. Just get one with at least 4GB RAM and an Intel CPU. Will this work with the new Windows 10? Toni, I haven't tried, nor have I heard that it will or will not work. We're going to Janome Institute next week and will ask about their software compatibility with Windows 10. I love my new Jamone 12000. I have not installed the software. Should I go to the Janome website to install first? 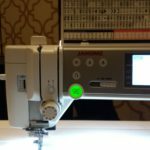 you might take a look to see if there are software upgrades on the Janome website, but it probably won't hurt to just install what you have and check it out. I have the 12000, and have been trying to open the designs on my computer in Horizon Link. I also have them on an external hard drive; does it make a difference? At this point, I'm just trying to figure out how to open designs. I have Wilcom, but that's way over my head, and the plastic on the dongle is broken on one side. It's still usable, but I baby it. 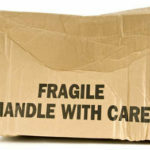 For a while, I had it it on an hub, but it tended to get knocked around. Ab is opening out all I can manage with that powerful program is open designs, anf sometimes resize them. I can't even figure out how to assign different colors to the designs. Now that I know that I can do that in Horizon Link, I'd like to use it. I understand how to put designs on a flash drive, and open them on the machine, but I can't figure out how to find them. I can't seem to find any options to open designs. Thanks for any suggestions. I need instructions on how to use Horizon Link. My instruction book 1200 does not do that it only tells how to use the machine. Rose, we're not really qualified to diagnose and/or give help with these sort of issues here on the TVSC blog. If you're not close enough to visit us, you might try your local Janome dealer. 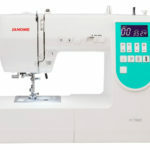 Also, it's possible that you may be able to contact Janome through their website, and they know their products best, so I recommend trying that.